The Cosmic Mandala is encompassed by a flaming circle. At the Centre is a three-footed spiral symbolizing a first movement, surrounded by rotating wind which condenses into so-called basic elements, representing the states of aggregation: Wind or Air stands for the gaseous state; Fire is usually depicted as a red triangle and stands for transformation; Water for liquid, represented by a half-circle or circle; Earth for solid matter, symbolized by a yellow square or cube. The emerging forms of the elements are painted in the blue ring surrounding the Centre, in the lower sphere intimating the world-continents to be. 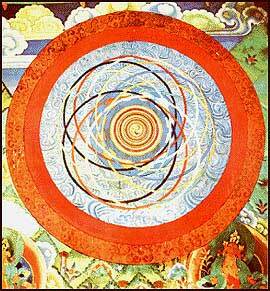 The blue Ether represents the all pervading condition, the source of all elements filling the space of the Mandala. On it circles are drawn; looking like ellipses in their dynamic intersection, they portray the orbits of celestial bodies, painted in all the colours of the rainbow plus black and white and indicating the directions. These twelve astrological circles of the upper sphere demonstrate the movements of sun, moon and stars in the seasons. 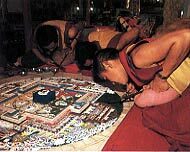 Tibetan monks constructing a festival mandala with sand and the dust of precious stones. 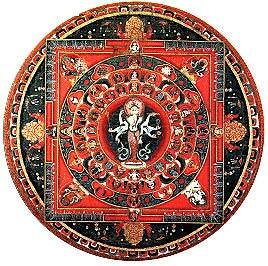 After the festival the mandala will be destroyed, thus expressing the insubstantiality of visible forms. Traditionally the Kalachakra Initiation has been a closely guarded secret and the viewing of the mandala forms the culmination of a twelve day initiation ritual for Tibetan Buddhist practitioners. However, the Dalai Lama, recognizing the many misconceptions surrounding Tibetan Buddhist practice, began presentations of the Kalachakra Sand Mandala to the general public as a cultural offering.